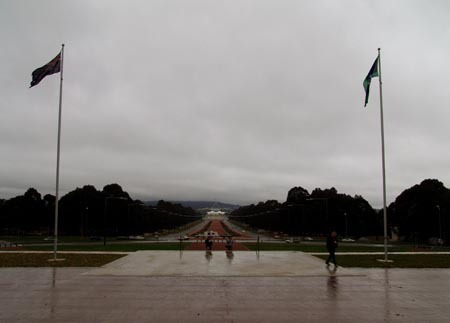 On the 7th, we left Canberra for Melbourne. 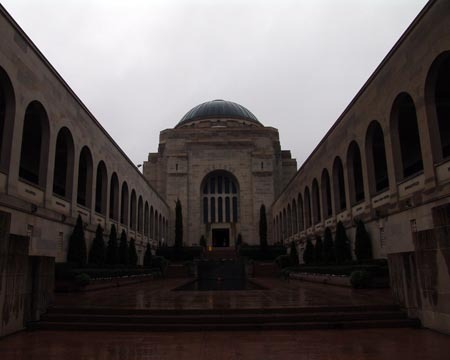 However, before leaving the nation’s capital, we decided to visit the War Memorial and museum. It was raining, so we didn’t stay outside long. 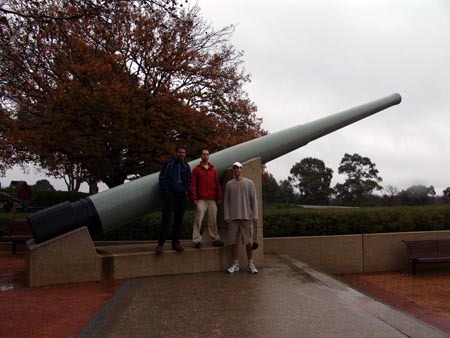 I managed to get a shot of the guys with the barrel of an Australian naval ship gun from WWII outside the museum. Big. Here’s a pic of the inner courtyard of the memorial/museum. The museum was really well designed and presented. There were informative displays and all sorts of cool stuff, like planes, tanks, and boats. For instance, they have a Lancaster Bomber from WWII that took part in the bombing of Berlin and other similar missions. They had audiovisual presentations at certain times as well in different parts of the museum. I think the one thing I learned that I had no clue at all about previously was that Australia was actually attacked in WWII on it’s own shores. There was a Japanese attack on Darwin (at the very northern tip of Australia) and in Sydney Harbour. Three midget submarines attached to proper subs were launched into Sydney Harbour at night. One became entangled in the metal anti-sub net that was not yet finished but partially spanning the harbour mouth. Another got past the net but tripped an electronic alarm and was shot at by naval ships in the harbour. These two were attacked with depth charges, and the wreckage later recovered. The museum has parts of the two subs, put together to form a full midget sub (each had damage to different parts). The third midget sub got into the harbour and launched both its torpedoes at the US heavy cruiser, USS Chicago, thinking it was an aircraft carrier. The torpedoes missed, but one hit the seawall and killed 21 sailors on the merchant ship moored there. This third midget sub was also attacked with depth charges from several ships, but was never located. Sorry I didn’t take a photo… but it’s quite cool. 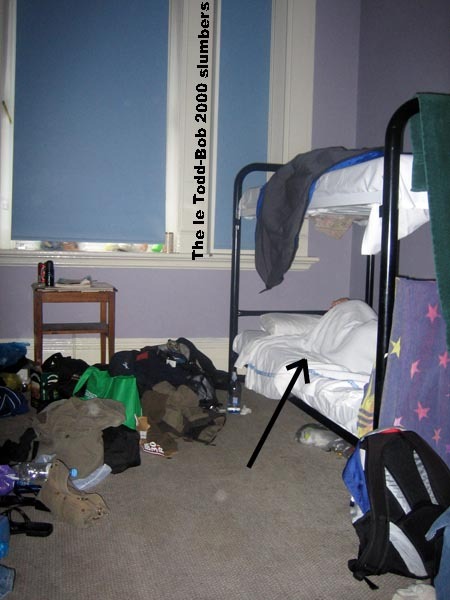 However, Todd (we call him the le Todd-Bob 2000 – don’t ask us to explain) took a few photos of different stuff. I like this one, of a WWII fighter plane. 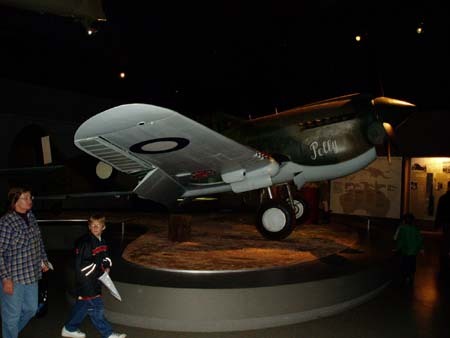 I can’t remember if it’s a Spitfire, but it looks close enough and was flown by the British and Aussies. Here’s a view from the front steps, looking toward the old and new houses of parliament wayyyy down the road. From Canberra, we headed south to Albury, a town in the middle of nowhere about halfway to Melbourne. 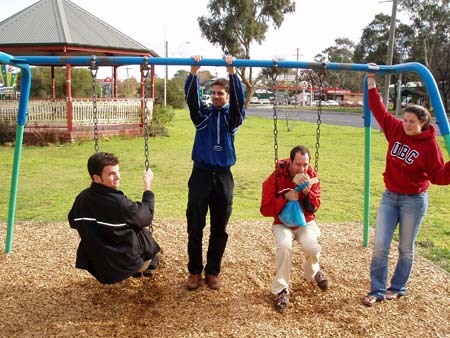 For lunch, we stopped at a random little town and played on the swings. 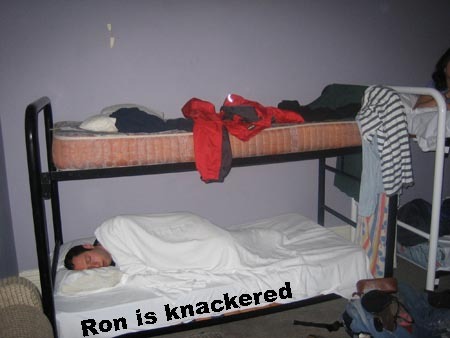 Todd kindly took this pic with Ron’s camera. 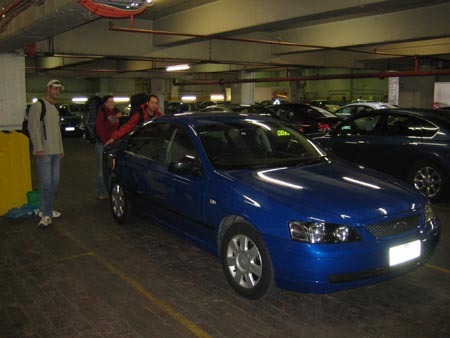 After a night in Albury, we headed to Melbourne and after dealing with rush hour traffic, returned our Ford Falcon without incident. 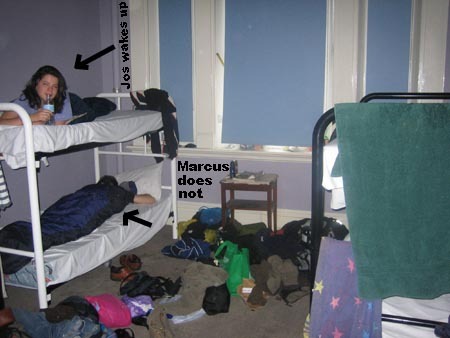 We found ourselves a hostel in the St Kilda area of town, and the next morning I took a few photos to illustrate the messy lifestyle we live while backpacking.